Vélo Vogue: Enthusiasm Is Beautiful! I take a lot of pictures of people on bicycles. Lots of them. I get all kinds of reactions. There has yet to be a time anyone has really protested, but there is definitely a technique to it. The big trick is to keep people talking and never put the camera down. It also helps, if while I am shooting someone, they actually know what it is I am shooting for. When I asked these ladies if they had heard of a blog called Vélo Vogue they went from hesitant to enthusiastic instantly! I find if I tell people right off the bat they start to pose. If I leave them dangling for just a moment, I get this kind of fantastic picture. What a couple of cuties! Can't get that driving a Prius. So if you see me out there with my big, fat camera pointed at you, remember that I am taking a picture of you because you look like a fabulous SF bicyclist (unless you are dancing naked with an Elmo doll, in which case I am shooting pictures of you because there is no choice)! LOL! Love it GF! I had such the opposite experience the other day while filming my Ride to the Gallows (France v. Mexico). Cold shoulder, brush off! Whateva! 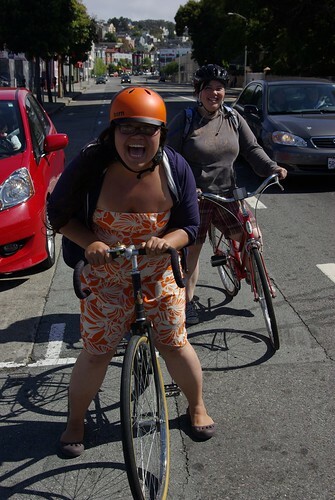 this is lovely mei ling hui and her raleigh lola (front)! she's gonna be happy to see this. oh my god she is soo cute! great picture! it makes me smile to see someone so excited about riding a bike!